Twitter’s marks include, but are not limited to, the Twitter name, logo, Tweet, Twitter bird, and any word, phrase, image, or other designation that identifies the source or origin of any of Twitter’s products. This section explains our guidelines regarding the use of Facebook’s logos and other trademarks. Use the corporate logo below to promote LinkedIn when discussing the LinkedIn Professional Network, as a whole. Logo and number one button icon. The below vector versions of our logo and badge are available for you to link to Pinterest. You can look up the official pages for other social networking sites in your favorite search engine. Create online pinboards (visual scrapbooks) using found images on the web, follow others and be followed by other Pinterest users. Your pinboard will look like a bulletin board of image swatches. 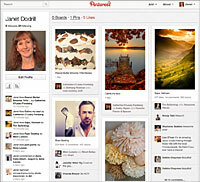 ‘Like’ an image on an existing pinboard and leave comments on other people’s pins. Understand the ‘Pin Etiquette’ of this new social media platform, amazingly popular in a short time [Be Nice; Credit Your Sources; Avoid Self Promotion; Report Objectionable Content; Tell Us How to Make Pinterest Better]. Start a Pinterest account, create custom Boards or use the default ones to start. Install a ‘Pin It’ button in your Firefox browser and start pinning images, linking to its original source. Read the terms to avoid copyright infringement. Have You Ever Been Asked to Write a Press Release? I love Twitter! It lets you find out what your friends are doing, and allows you to let them know what you are doing in 140 characters. It is micro-blogging. One can follow others – up to 1000 per day. Others can follow you. There are applications developed for Twitter, and Twitter Fans can post additional apps to a public wiki page. Other apps are available on Mashable [The Social Media Guide] site. Twitter users ‘tweet’, like birds, to eachother, when they post to their profile page. Twitterers can send direct messages to eachother. They can also retweet other people’s posts if you find them of value or think other users will. Wefollow.com is a user powered Twitter directory. You can find who’s on Twitter by popularity listed by category, such as celebrity, news, tv, radio, and more. You can add yourself (your Twitter username) to a category to be listed. Movie star Ashton Kutcher just topped the charts and some of the We Follow categories by reaching 1 million followers (and rising) in a competition against CNN. Even social sites like Twitter can get infected with viruses and worms. The problem happens when you visit a site that is infected. There are ways fix the problem. For updates check the Twitter blog. Ashton Kutcher and his wife, Demi Moore, tweet all the time, and post pictures and video of eachother and most recently of their trip to southern France, and of the set and other celebrities (including Tom Selleck), while Ashton filmed a movie. In the Mashable article, The Fastest Growing Social Sites, it states that Twitter is among ‘the big three’ (others being Facebook and MySpace) and has now grown by over 2,500 percent in the past year, and that number is expected to grow. Feel free to follow me at www.twitter.com/janetdodrill.